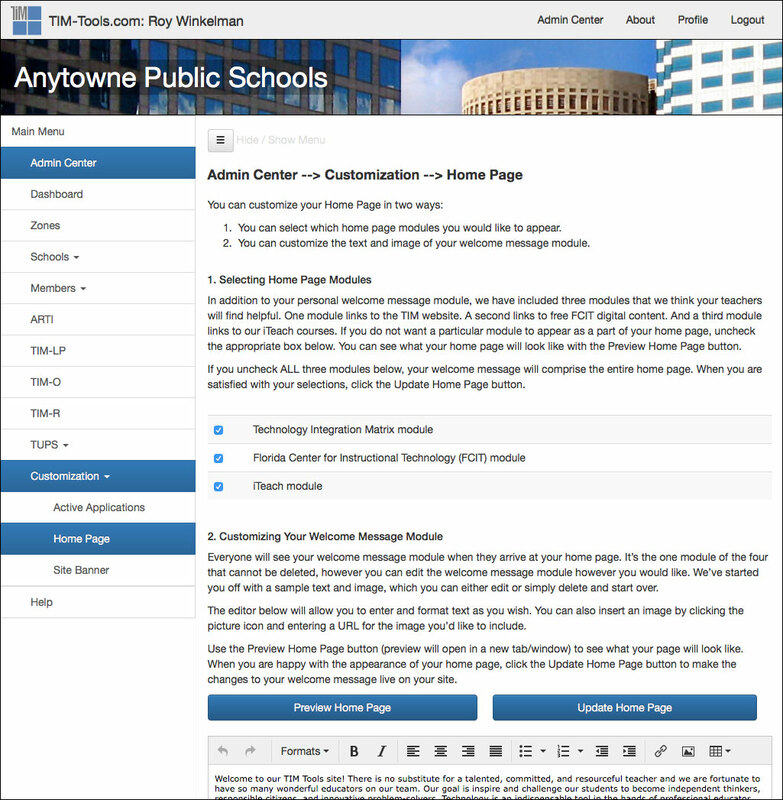 This page is a preview of the contents of the following pages in the Admin Center section. 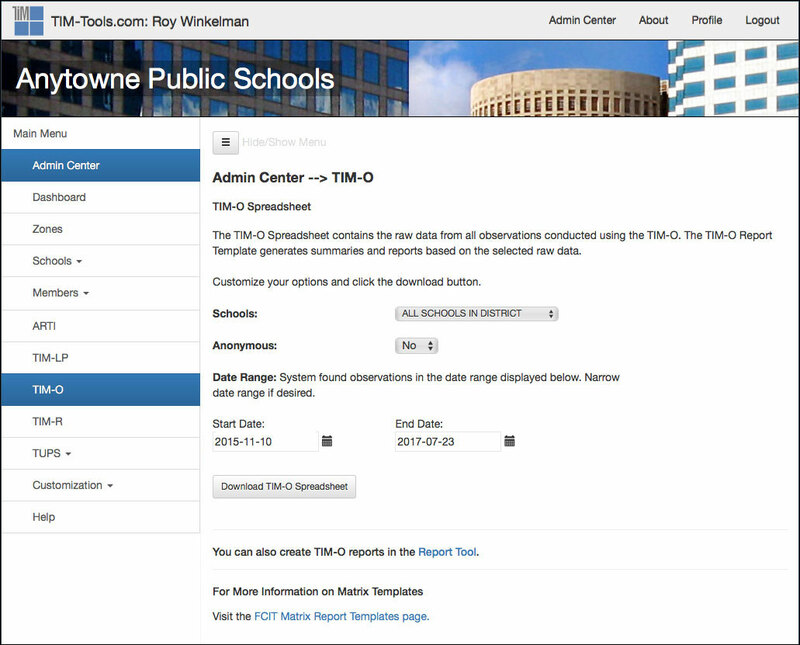 The TIM Tools Admin Center gives administrators the ability to upload lists of schools and members, assign observers, administer member passwords, and generate reports. 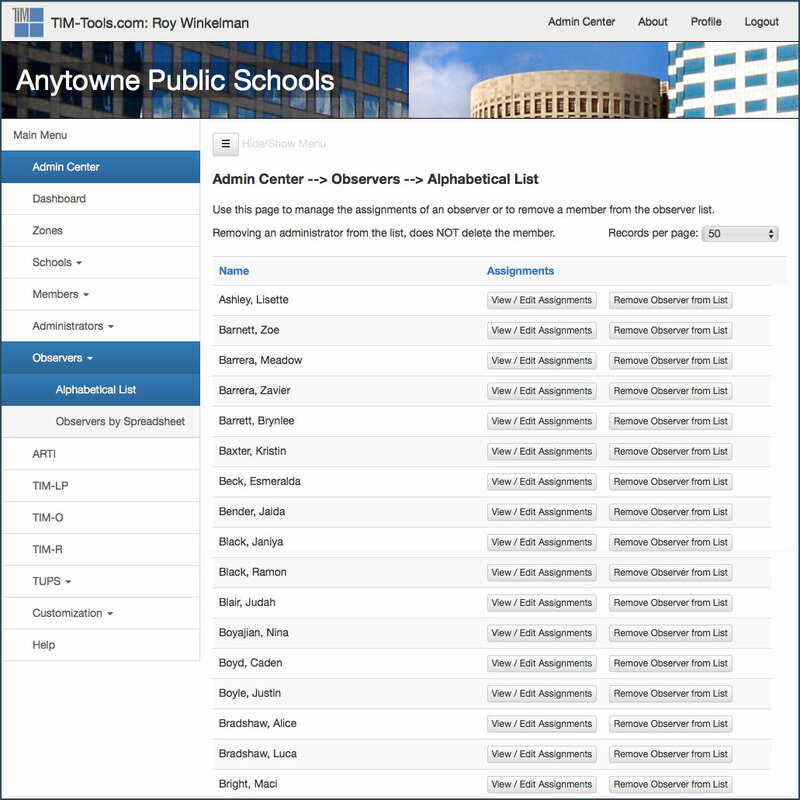 The district version also allows the grouping of schools into zones for assigning administrative and observation responsibilities. 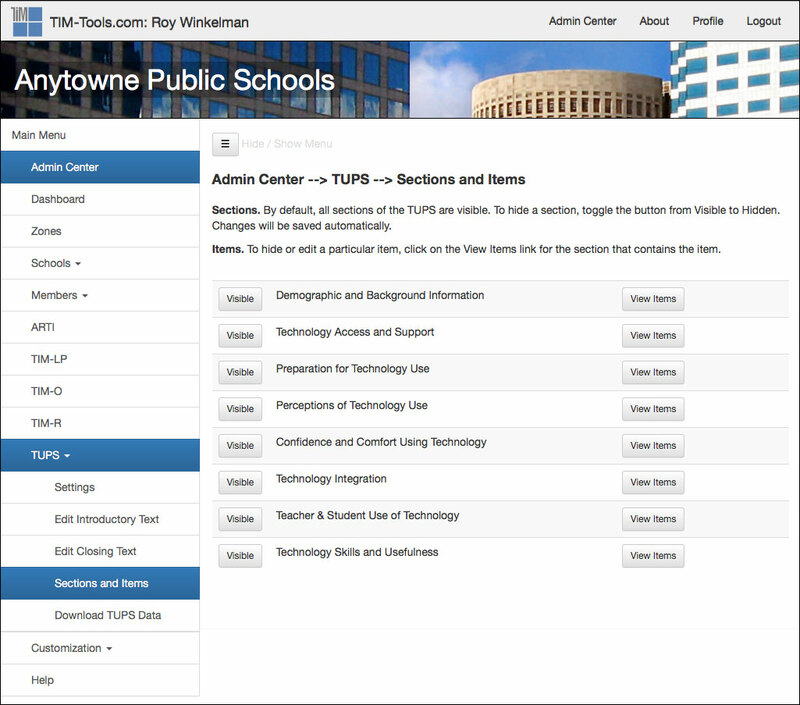 The Admin Center provides great flexibility in how the TIM-O is used. One school might limit observer status to upper-level administrators. Another school might include department heads and team leaders as observers. Still another might grant observer status to all faculty members so that they can conduct peer observations. Reports of all completed observations can be viewed in the Admin Center or downloaded as a spreadsheet. 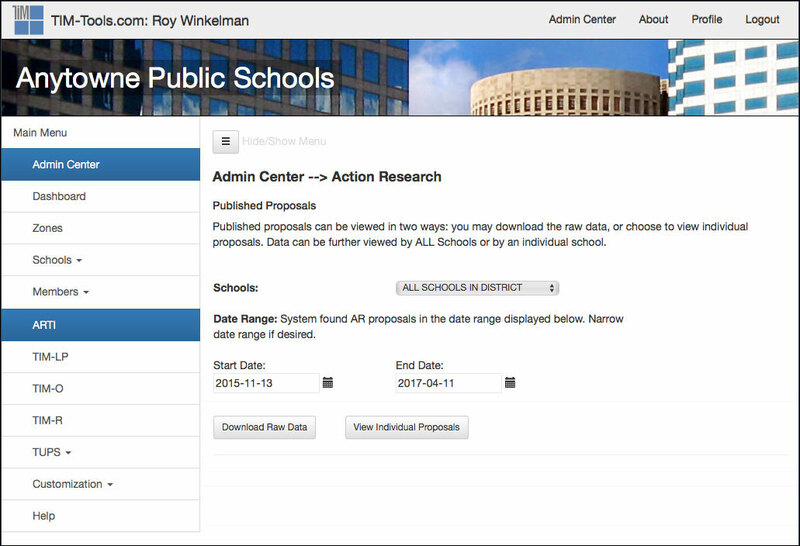 Pasting the raw downloaded data into specially-designed templates instantly generates extensive reports that identify needs, provide insight into the current levels of technology integration, and pinpoint the most pressing (and promising) professional development topics. Version 6.0 of TIM Tools added a great deal of flexibility in assigning permissions to member roles. Most of the screenshots in this guide display the Super Admin’s view of the page. Users assigned to other roles may see fewer administrative options on many of the screens. You needn’t get bogged down in the details of this section. Remember that there is plenty of guidance within the Admin Center itself and, of course, we are always ready so assist clients in setting up and managing their TIM Tools instance. Figure 1: Dashboard. 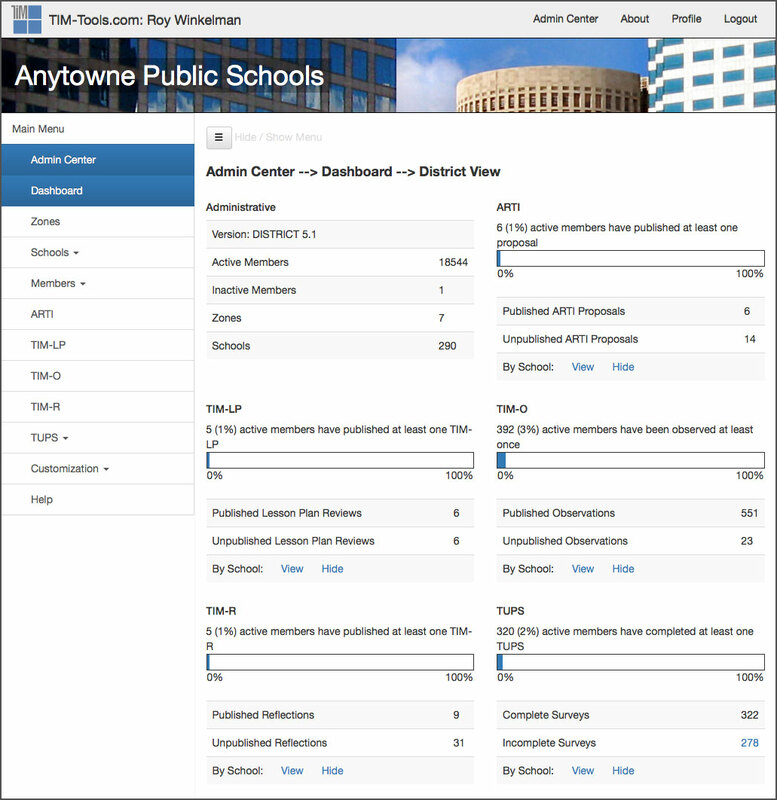 The Admin Center dashboard gives a high-level snapshot of general membership, schools, zones, administrators, and observers. It also shows total activity of each of the five tools. 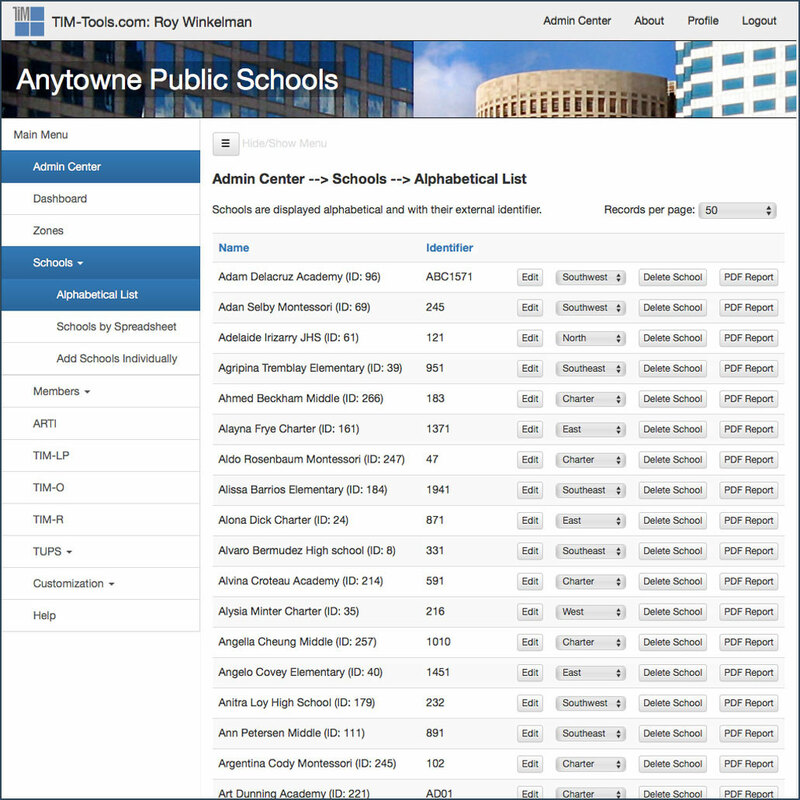 NOTE: Your school or district’s name will appear in the banner on each page where you see the words “Anytowne Public Schools” in the screenshots. Figure 4: Members Panel. 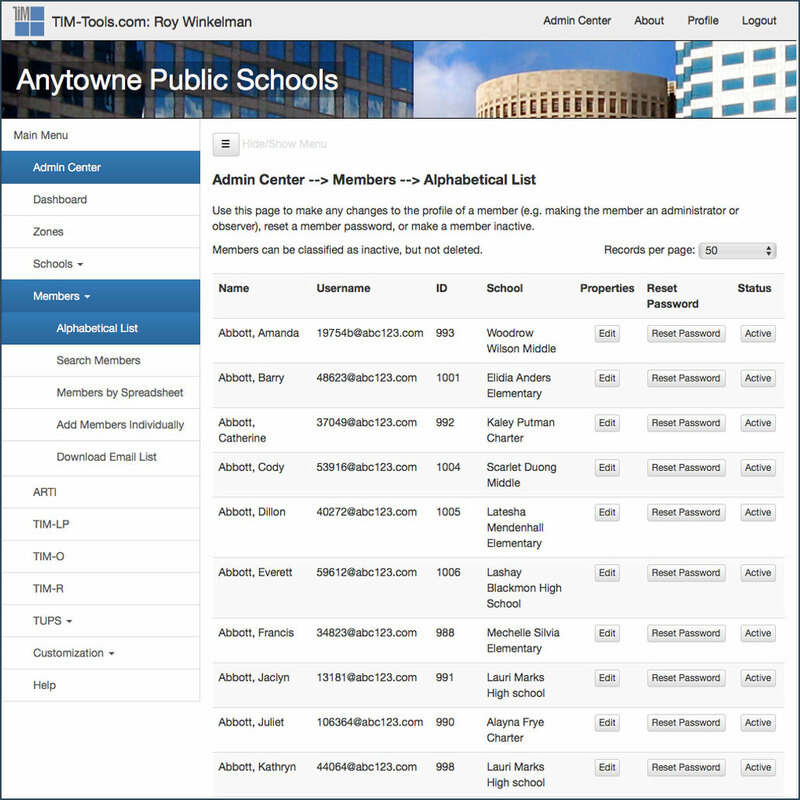 All persons, whether teachers, observers, or administrators, are “members” in the system The five sections of this panel provide for the manual editing of members, a member search, the uploading of members by spreadsheet, the manual addition of members, and the downloading of a complete list of members’ email addresses. 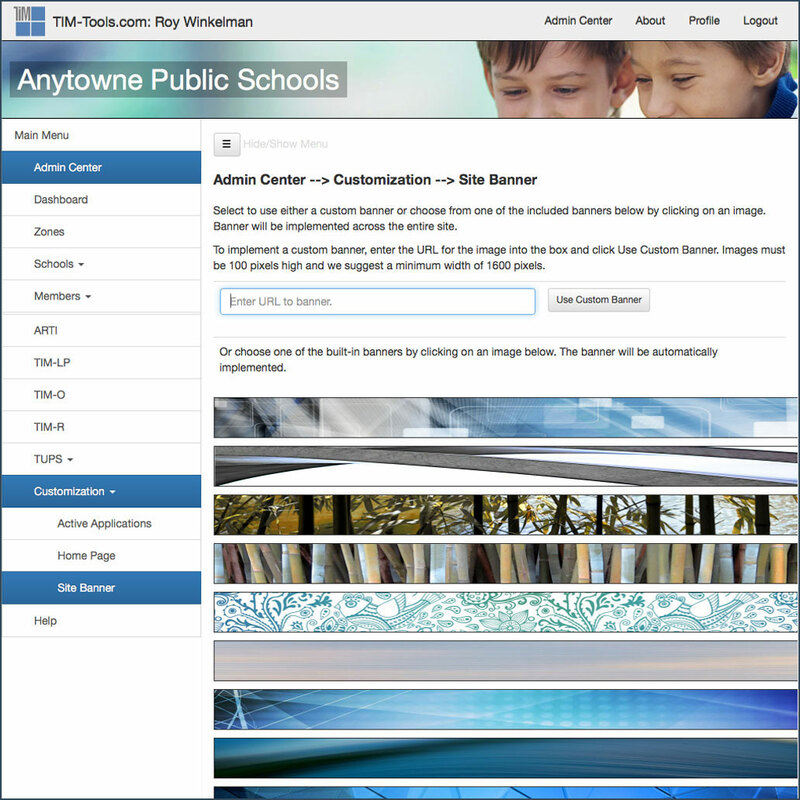 Figure 5: Administrators Panel. 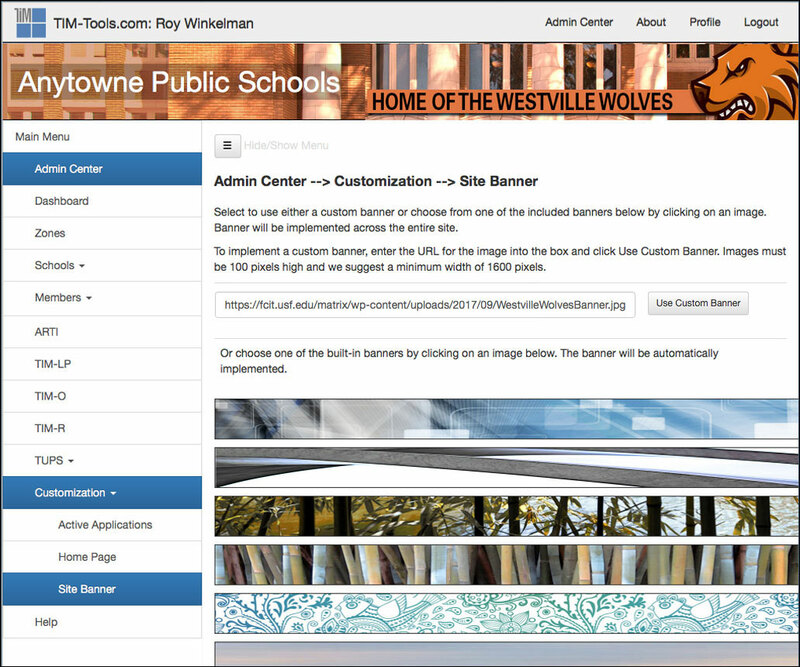 The administrators panel has two sections. The first section allows the assignment of administrator rights. 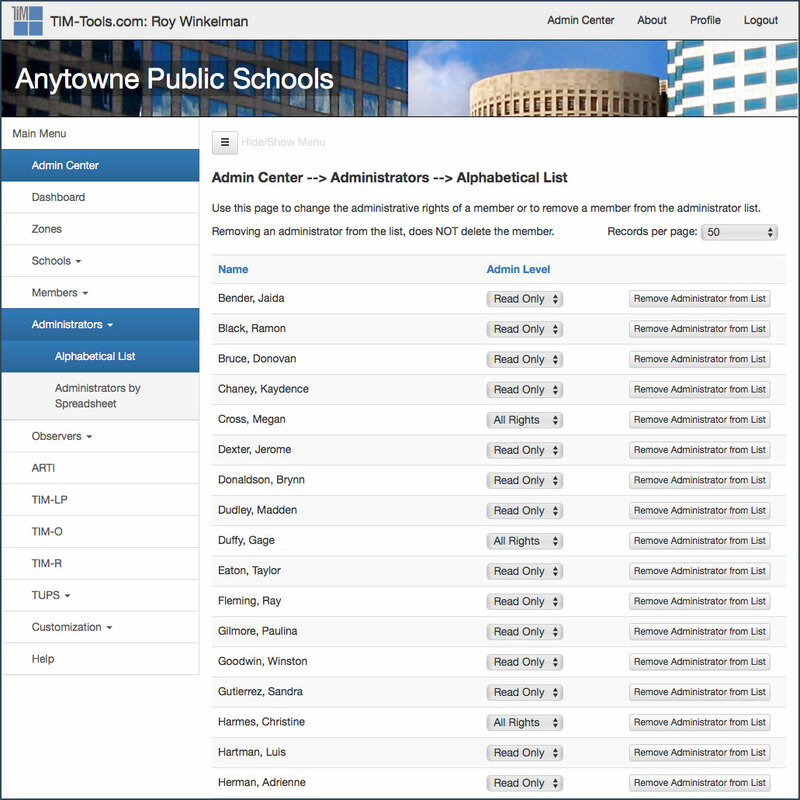 The second section allows for the uploading of administrators by spreadsheet. Figure 6: Observers Panel. The observers panel also has two sections. The first section allows for the assignment of individual observers to any combination of schools and zones desired. The second section allows for the uploading of observers by spreadsheet.